The oldest known Drumbar Cassidys are the brothers John and William. John married Kitty McGinty and moved to Clogher. William was born in 1799. We do not know his wife’s name and the only child we are aware of is son Francis, who was born in the 1820s or 30s. Francis married Rose McGilloway of Glenfin. They had at least two children, Kitty and Francis (1844-1888). Francis married Annie Kelly of Drumanus. The following information is about Francis and Annie and their descendents. Note- recently we received an e-mail from Katherine O’Callahan Payne, who is the granddaughter of Edward John and Bridget. She lives in the San Francisco area and is a dedicated family historian. 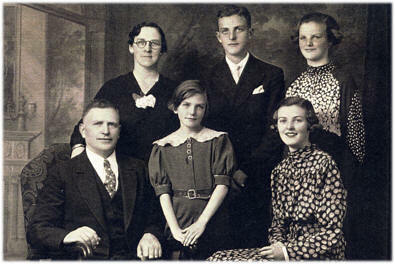 Notes: Edward John was born on July 7, 1884 at the family farm at Drumbar, in Donegal, Ireland. He was the second child to Francis and Anne Kelly. As a child he was called “Eddy” by his eight siblings. All the children helped on the farm, cutting turf at the bogg, baking, knitting, and were well cared for, but had a frugal existence. They gathered kelp from the sea to use as a natural fertilizer for raising potatoes. On their 90-acre farm, they raised dairy, oats, barley, hay and flax and had six paid day-laborers. Eddy attended the local school and only attended four years of formal education, equivalent to eighth grade in the United States. Eddy had a constant thirst for knowledge all of his life, always asking questions, and could recite poetry without pause. Edward John set sail for a new life in America in 1912 and was unable to find work in New York. “Irish Need Not Apply” signs were well posted. He made his way to Macom, Georgia to find his friend, Andy McGinty, who had several bars. Edward worked in the industry and owned several bars, though he never imbibed. After saving some money he made his way to San Francisco, where his cousin, Annie (Cassidy) and her husband, Pat Loftus and family resided. After he had saved a little money and felt he could support a wife and family, he gave it considerable thought. A mutual friend, Con Murray, suggested the lovely young Bridget McNulty, who was currently working in Philadelphia at the time. Ed had met Bridget in Ireland at one of the dances. First Edward corresponded to her family in Ireland, asking permission to “court young Bridget” then correspond back and forth with the lovely Bridget. He proposed and sent the Tiffany set diamond ring through the mail. Bridget came by train to S.F. and they were married on May 28, 1917 at St. Peter’s Church in the Mission District of S.F. For their honeymoon they borrowed a car and made a trip to the top of Twin Peaks in S.F! Ed had a bar in the Mission District but when Prohibition came along, he closed the bar and made a living as a Pinkerton Man, riding the Southern Pacific train from S.F. to San Luis Obispo. A few years later, as his family of four children, were growing up, he bought The Independent Laundry and later in years joined partners in The Cadillac French Laundry. He helped run this business until poor health interfered and he sold his share. He owned an apartment building where he resided. After raising his family, he and his wife, Bridget, retired to a little cottage in the small town of Glen Ellen. In 1948, Ed and Bridget made his only trip back to the family farm and helped rebuild the stone shed (cow barn). Just a few short years later, in 1951, Ed was diagnosed with an aneurysm of the aorta. No surgery procedure was yet available. It was a painful illness and he died on September 6, 1952. Hugh Cassidy was another son of Francis and Annie. 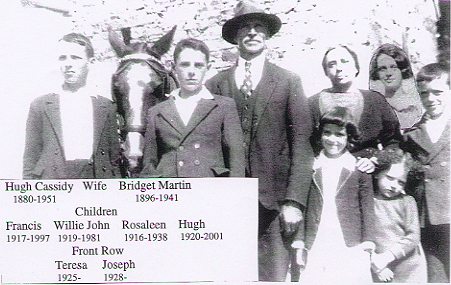 He married Bridget Martin and had seven children. Some of their descendents still live in Drumbar. The following outline shows all of the descendents of Francis and Annie known to the author (John Cassidy).